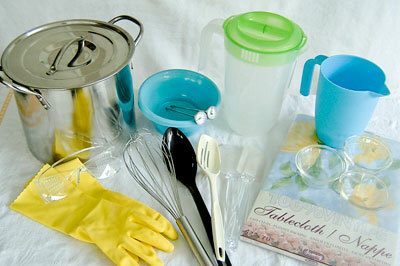 Soap Making Supplies - The tools to get you started! Looking for soap making supplies? You've been thinking about it for awhile. Wondering if you should spend the extra money and if it will be worth it. And I can honestly tell you that yeah, it's definitely worth it! Don't panic too much about the extra expense either. Sure you could spend a small fortune buying all the latest and greatest gadgets but seriously, you can fully equip your soap kitchen very easily without breaking your wallet. Before you spend a single cent, take a look around your kitchen. You might be surprised to find you already have some of the things you need. Just keep in mind that whatever you confiscate from your kitchen cannot be used for anything but soap making again. If you're like me, you probably have two of some of the items on the following soap making equipment list lurking around taking up valuable space in your cupboards. Next, check out your recycling bin. I'm not kidding! You know that margarine container you chucked in there just the other day? Well that is actually a soap oil measuring device. Highly sought after, I can tell you. Got an empty milk carton in there too? Great disposable soap mould, especially for when you are just starting out. Grab some cardboard while you are at it. Might come in handy to place on top of the soap mould when you are wrapping the just poured soap into blankets. Now you can head out the door to do some shopping. Get yourself off to the local thrift shop, it's the perfect place to find soap making supplies. They always have items like juice jugs and measuring spoons for super cheap. See what else you can find from the list. The more bargains you find, the more money you will have left over for the soap making ingredients. 1. A soap making scale that is accurate to the nearest gram or 1/10th of an ounce. 2. A stainless steel 8 - 12 quart/litre pot. 3. A 2 quart/litre plastic juice jug for mixing the lye and water into. 5. Mixing and measuring utensils - a whisk and/or hand blender, silicon or rubber spatulas (2 would be best), plastic spoons (like the wooden ones) and measuring spoons. 10. A piece of wood, Styrofoam or cardboard the size of the soap moulds' top opening. 11. Old wool blankets to insulate the soap with. 12. Safety equipment - rubber gloves, apron or old clothes and safety goggles. 13. A thin, sharp knife to cut the soap. You may find, like I did, that a knife tends to cut soap like it does cheese, leaving the bottom edge uneven, and decide to make or buy a proper soap cutter. 14. If you want your soap to have smooth bevelled corners, you might want to try your hand at building a soap beveller using a tutorial that Bernardo (unfortunately I never did get his last name) made and was kind enough to let me use for my site. 15. Plastic table cloth or something similar to protect your table, floor or counter-tops. 16. I also like to have a few ramekins and small jars on hand to put any additives in that I will be adding to the soap at the last minute. Once you have assembled all of your soap making supplies, it's time to head on over to the recipe pages and decide which homemade soap recipes to try.